Compatibility: Requires iOS 9.0.2 or later. 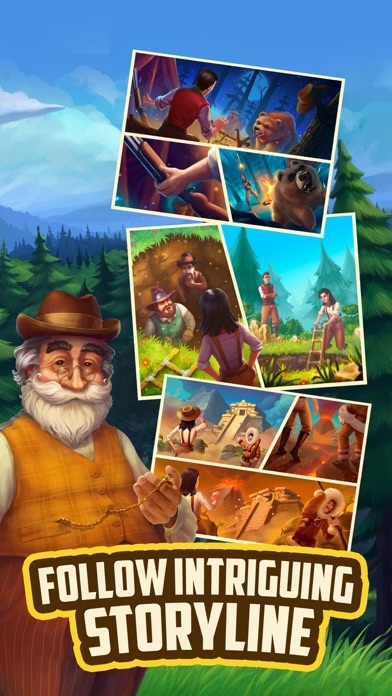 Travel to the time of Gold Rush with Klondike Adventures! Explore the wild territories of Alaska together with valiant Kate and adventure-savvy Paul. Build a strong and prosperous city in these vast cold lands! Klondike world is full of exciting expeditions, hidden treasures, great opportunities, and challenging quests! - Welcome to the gold rush era! Go on expeditions to the North and become a true adventurer. - Complete challenging and yet enjoyable quests! Help explorers Kate and Paul solve mysteries of the locals. - Turn a deserted station into a flourishing city! 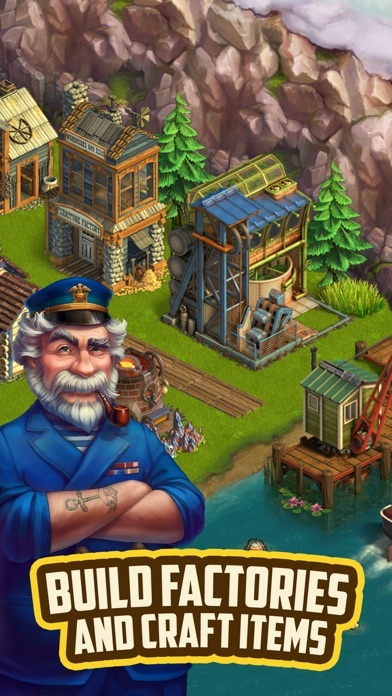 Build factories, mine for resources and craft everything you need for expeditions and quests. - Start your own farm in the wild! 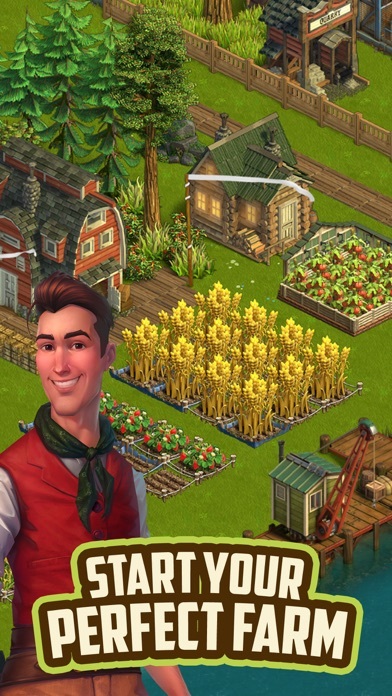 Raise animals and harvest crops to make food and clothing for yourself and to trade with the locals. - Enjoy the breathtaking scenery and landscapes! Every corner is packed with wonders and mysteries! - Meet outstanding characters and hear their compelling stories during your journeys! The wild lands of Alaska hold many secrets and thrilling adventures. 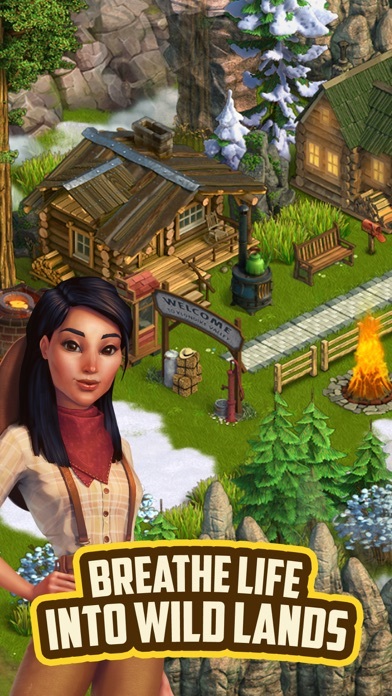 Play Klondike Adventures now and enjoy your Gold Rush experience! Nice game but bad economics. I’ve been playing this game for about a month, and I’m seeing big time, what other reviewers are complaining about. Although it’s a fun game to play, I Hate coming into the game and getting to play for 2-5 minutes. Then I’m out of energy. Capped at 50-60, and taking 75 minutes to get that much energy? Then you take out 1-2 lilacs or other bushes and all energy is gone. And no, there is not much to do when you’re out of energy. It’s boring watching carrots grow. And also no, I’ll not spend $1 on a game that is this much of a money pit. Change the way energy runs, and how that’s used to explore, and you may have a game worth 4+ 🌟. I was an avid Farmville player years ago. I downloaded this game. Sorry. Did not even remotely care for it. I’ve never written an app review before, but I feel inclined to do so based on my experience. There are many reviews lamenting the energy problem with this game (caps out at 50, difficult to obtain, etc.). I had similar issues and had no problem spending the 3.99 here and there to get me through tricky spots in the game. Upon looking at my Apple receipts, however, this app appears to be charging me double, sometimes triple the amount I consented to spending on the app. It may not seem like much, but that charge adds up incredibly quickly. I’ve been in contact with Apple Support, and they’ve insured me that these charges are coming from the app, not the App Store. I’ve since deleted a game I enjoyed playing. Be warned, and watch your receipts. 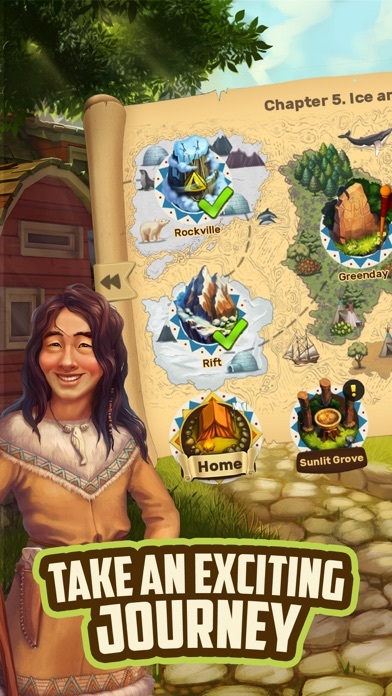 It's 2019, maybe don't make a game that's literally all about ravaging indigenous land for resources while the indigenous people in question smile benevolently at you. Just a thought. It is a really fun game, but don’t spend money on gems, because customer service won’t help you when the game glitches and you lose some gems. I went back and forth with them several times, to no avail. I will invest in a different game. What a shame. They lost a lucrative account with me. I love the game. I like the variety of building a town and exploring. The game’s major downfall is how hard it is to get energy to continue play. I would play much more if I could do so without it costing so much money. Fun but kind of dum. I enjoy playing this game as it combines farming and adventure/discovery. It’s definitely not a quick rewards game, but something you need to spend a bit of time on each day for the long run. The only criticism I have is that energy is spent too fast but to gain energy is a slow process. I don’t like that there is currently at 51 energy points cap even though I don’t play it for an entire day. And then when I do play, I have to cut a tree that’s 70 energy points, and immediately I can’t do anything else.. I wish the energy gained and spent were a little more evenly distributed. I gave Klondike another try and it can be addictive but there are issues. I have no problem spending money if the game is worth it and i saw the developr's response to one of the reviews that the game is suppose to be challenging and relaxing but that does not mean make it impossible to play. The energy issue is the biggest complaint customers have had but the developer will not fix this problem or make it more balanced. You cannot enjoy and relax in a game if the little amount of energy one has is used within 1-3 turns, meaning getting anything done is close to impossible. For ex., i received a chance to play the pearl maze and the timer gave 3 days but with 50 energy and starting timed event, each time i was done within 3 min due to only getting 1-3 turns before energy ran out and mind you this is a time event so impossible to collect pearls if no energy so i gave up. Why the energy bar is tapped at 50 energy max is beyond me. 2nd issue is the game loading, for the past hour it says "connecting to server..." and i have no problems with getting online with other games but this one so i cannot play and yet the pearl maze event is running out of time lol. 3rd issue, the boat/ship/post requests things i cannot even grow yet and i cannot make enough money to build the bakery to make flour so i can make glue to make a simple home that takes two diff types of tables lol. I am forced to level when i am not ready just by completing orders so the game server/computes sees i have access to more complex items when i am still trying to clear my main land and build. If the developer fixed these issues but mainly the energy issue, the game would be fun and relaxing and i would want to spend money. Lastly, please do not offend customers who are willing to take the time to explain what the issues are that could easily be fixed by giving us robotic and simplistic answers bc makes it look like you are oblivious to what we are complaining about bc i personally see this game has potential and even though you are not hurting for money i would spend but on that issue, the deals offered are not deals like for gems. Thanks. More by VIZOR APPS CORP.